As an avid bargain hunter, I love when I discover a gorgeously cheap little gem. And the MUA Superdrug line has done it again! MUA has launched a MUA Profesional line, and I gotta say, this line is great value for money. And they have some gorgeous shades! 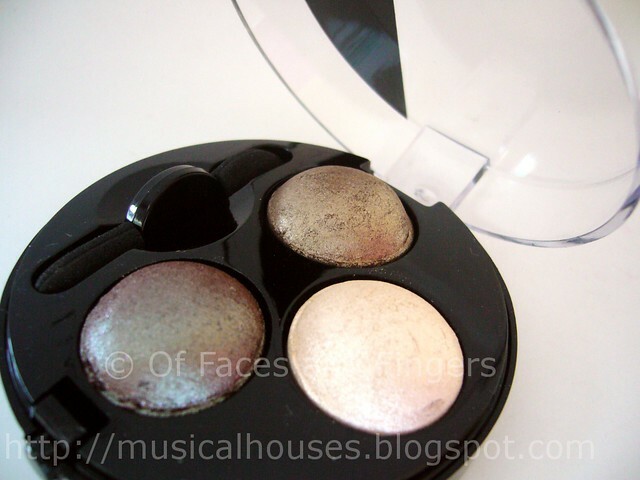 I especially love the Eyeshadow Trio in Innocence, shown below. 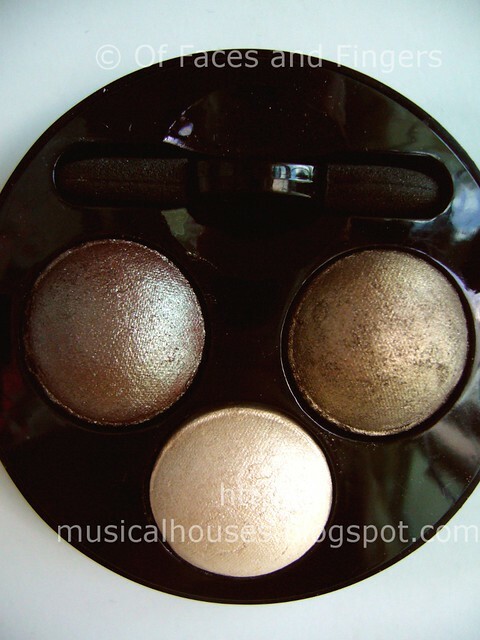 You can kinda tell that I'm in love with this right now, simply because I'm going to spam you with photos of this Eyeshadow Trio! 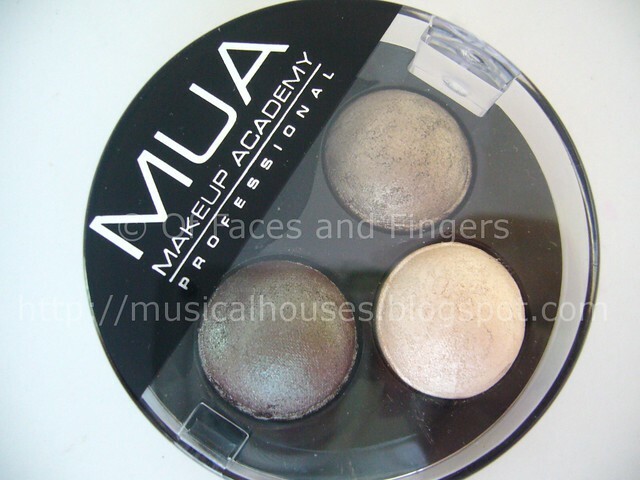 The MUA Pro Eyeshadow Trios come packaged in a plastic container that's cheap and light, if a little flimsy-looking. But it's the inside that counts, right? Inside, you get a three small domed eyeshadows, as well as a tiny sponge tip applicator. Personally, I prefer using my brushes, but that tiny applicator is good in a pinch, too. Innocence, as the name suggests, consists of a lovely set of three neutral shades, all of which have some shimmer. There's a light beige, an antique golden brown, and a deep chocolate brown with a little bit of green flash. Here are swatches of the Innocence Eyeshadow Trio. These are actually well-pigmented, and worth it for the price. The beige shade is the least pigmented of the lot, but even that can be built up. 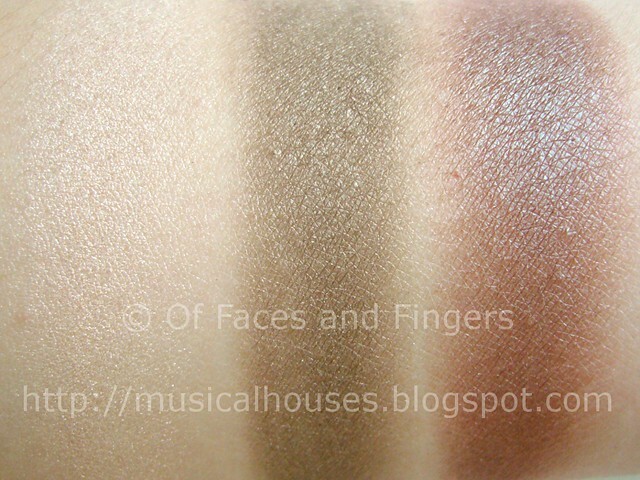 The two brown shades have great pigmentation. My favourite shade is the golden brown shade in the middle - it's absolutely gorgeous and neutral without being boring or looking muddy. 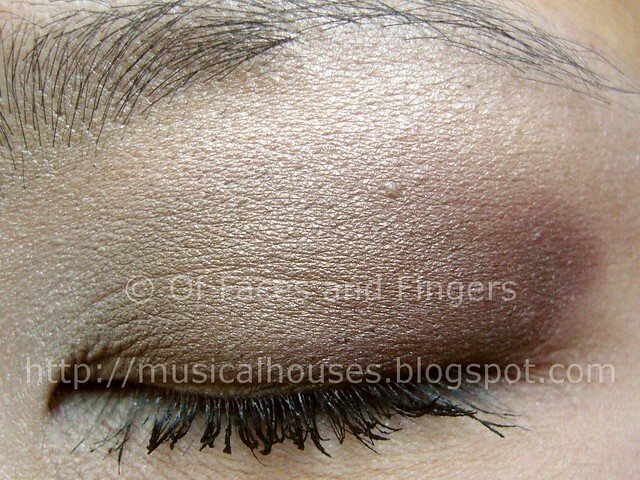 It kind of reminds me of Stila's Wheat and MAC Patina eyeshadow. The base colour actually reminds me of the Mimididi Diamond Powder Eyeshadow I reviewed recently. I love these type of golden antique brown shades! I also like the deep brown shade, which has a green flash that makes it so much more interesting. 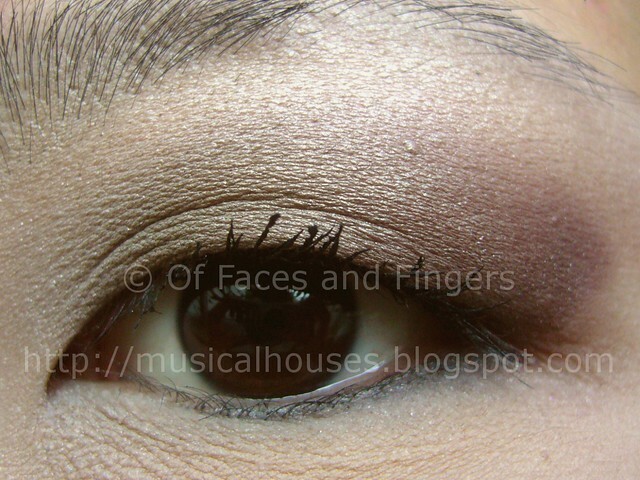 But enough with my raving, here's an EOTD (Eye of the Day) with the MUA Innocence Eyeshadow Trio. The shades in the MUA Innocence Eyeshadow Trio also go together very well. Initially when I swatched the colours, I thought the pairing of the warm chocolate with the cool-ish antique gold was a little bit of an odd combination, as they looked like they may be clashing colours. However, upon application, the colours worked together quite well. I'd be absolutely willing to use these shades altogether, just the way they are presented in the palette. All in all, I'm pretty impressed by this, and there isn't much I don't like. The Innocence MUA Pro Eyeshadow Trio has a bunch of pretty shades, is super cheap, is well-pigmented and blendable, and can easily be anyone's go-to trio of neutral shades. The only thing I felt could be done to make the palette better was to coordinate the shades a little more - perhaps by making the warm chocolate brown less ruddy. But for £2.50, I really can't complain! The shades compliment each other beautifully! What a lovely product. Would you know where this product is available internationally? Lovely shades!!! I really like that middle swatch. So pretty! @Katherine Tealeaf: Right now I believe they sell only at Superdrug, and I'm not too sure if Superdrug ships overseas. If not, perhaps eBay or other such similar sites may help. I also like to get one of my nice friends in the UK to buy and mail it over to me. Hope this helps! Love the colors. Great blog too. New follower here. 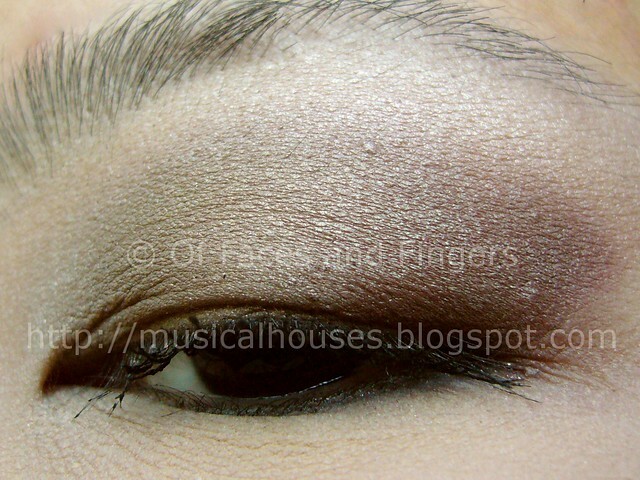 I have this and it's so lovely for a daytime or evening look - I also have the pinky shades palette (sorry not to hand so haven't a clue what it's called) which brightens up my eyes amazingly! This packaging is sooo similar to Bourjois eyeshadow trios! lovely colours! I haven't been able to get ahold of MUA products here in the states. Which is too bad as i'm quickly falling in love with their selections of palettes.